Although he's been gone for more than 15 years, Owen Hart's history with SummerSlam is rich. He was a part of one of the best main events in the history of the summertime tradition when he wrestled his older brother Bret in a cage match in 1994. That match was for the WWF championship and came on the heels of Owen being crowned the King of the Ring. If that match happened when there were two different brands, I have no doubt Owen would have won the championship. He was so talented and is missed to this day. The SummerSlam Owen has become infamous for is the event in 1997. 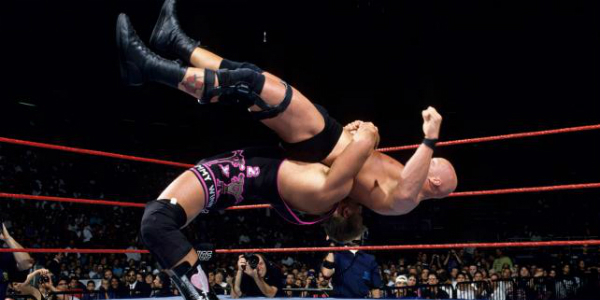 He was defending the Intercontinental title against "Stone Cold" Steve Austin. Near the end of the match Owen messed up a reverse piledriver, causing the Rattlesnake's head to hit the mat and jamming his neck. The move took a lot out of Austin and it's clear that Owen helps in the closing moments, essentially pinning himself to lose the title. The move changed Austin's career forever and I think it's safe to say shortened his time in the ring significantly. It was clearly an accident and as I fan of both men I never held any ill will toward Owen. Owen only won one of his four SummerSlam encounters. The victory came in 1996 against Savio Vega. The two had spent the summer feuding and I watched the two at a house show in St. Louis a couple months earlier. Savio won that match. And in his final SummerSlam in 1998 he battled Ken Shamrock in the previously blogged about Lion's Den match. His won-loss record wasn't as nearly as impressive as the work he did inside the ring. Win or lose Owen will always be remembered as one of the all-time greats. May he continue to rest in peace.